Peep these lovely, well-established succulent terrariums by Botany Factory, as featured at the General Store blog. 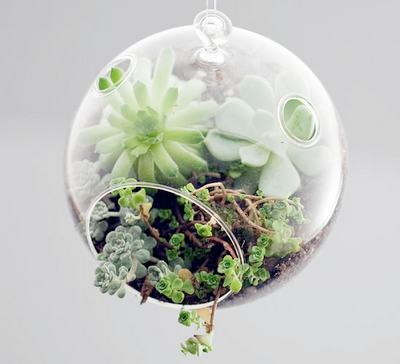 The bubbly, organic feel of the original glass containers enhance those fun bulbous succulent leaves. Botany Factory is a San Francisco based studio whose mission is to bring greenery to small, indoor spaces. A plant enthusiast from the start, Katie Goldman Macdonald began her early days accompanying her banjo playing, botanist father on wildflower classification walks through the woods. Ever after, she has nurtured a growing desire to have dirt on her hands and flowers in her hair. She works with Oakland based glass artist, Evan Kolker, to have her designs brought to life. All her hand blown forms are organically shaped, playful and one of a kind. I love how the glass containers are so unique! gorgeous! 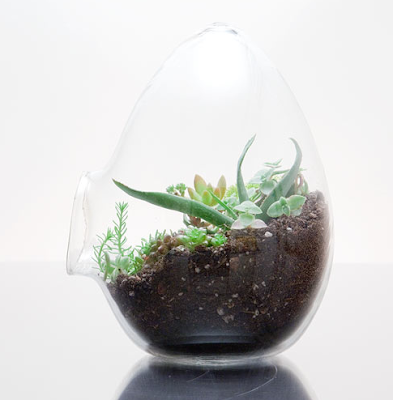 I have become obsessed with terrariums and was browsing and stumbled upon seedtostem.org ...They have some fabulous creations..look under "botanicals"!